Woke and walked Mix. My aunt was coming down today and so I got coffees and some food ready so that Olive would not be put out (she has started marking examinations again and has to spend all day in her room). 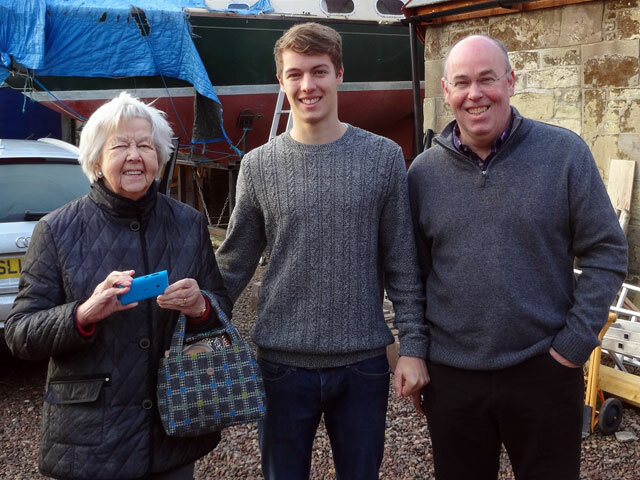 Our visitors arrived and we had a very happy morning with them (and yes, Olive was allowed out for a quick coffee). After they left Rachel and I started to unpack more books from the carriage shed – the pile of boxes is going down slightly but there is still a long way to go. Having unloaded the boxes the next step was to empty them and put the books on the shelves of the bothy. It will be a long job – and one which is made longer by the fact that I keep on finding interesting things and have to stop and ‘play’ with them. Today I found a disk of ‘Jack the Ripper’ a show we did at Buckhaven many years ago. So I stopped and watched it (and enjoyed it, too). David arrived to fit the new brake-pipes to the boat trailer and to have a coffee. Later we dined in the farmhouse and in the evening Rachel and I watched the final part of ‘A Very British Coup’. It wasn’t very long so we tried to watch GBH, another old production. However this didn’t work on our television so we settled on the introductory episode of ‘Lipstick on your collar’. It was good. No cricket tonight, and I have finished my book, so we walked the dogs and went to bed. A happy day.